Over 400 physicians and clinicians representing 14 countries around the world will gather this week at the Loews Coronado Bay Resort will gather this week for the second annual International Plant-based Nutrition Healthcare Conference. Drs. Ornish, Esselstyn, Campbell and many of the foremost experts in preventive, nutritional medicine—whole food, plant-based nutrition—are featured as part of the conference faculty. Physicians and clinicians from around the globe will gather this week, September 17-20, at the Lowes Coronado Bay Resort for the second annual International Plant-based Nutrition Healthcare Conference. This CME accredited medical conference will educate gatekeepers of dietary-related advice—our physicians and healthcare professionals—about the nutritional science that overwhelmingly supports the efficacy of whole food, plant-based nutrition and its proven ability to prevent, suspend and, often, reverse the chronic, degenerative disease that’s plaguing the U.S. and much of the Western world. Critics long have hammered physicians and the conventional health care establishment for failing to marshal a systematic, comprehensive effort to prevent chronic health conditions and break down the barriers to wellness. Now there's a financial incentive. Hospitals and health care providers are rewarded under the federal Affordable Care Act and new Medicare rules for keeping people out of doctor's offices and avoiding costly readmissions. The conference faculty features Drs. Ornish, Esselstyn, Campbell and many other prominent voices, representing the foremost leaders in whole food, plant-based nutritional science and clinical nutrition, whose research and leadership are at the forefront of the preventive, nutritional medicine movement. 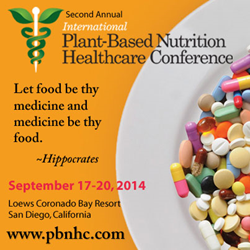 Leading experts in preventive, nutritional medicine will be presenting at the second annual International Plant-based Nutrition Healthcare Conference, September 17-20, 2014 in San Diego, California. This CME accredited medical conference will educate gatekeepers of dietary-related advice—our nation’s physicians and allied health professionals—about the nutritional science and efficacy of whole food, plant-based nutrition and its proven ability to prevent, suspend and even reverse disease. The review of current and progressive scientific research will be presented with a commitment to intellectual integrity, without bias or influence. This event is proudly presented by Whole Foods Market, Enrich Creative, Forks Over Knives, Total Health Immersions and Rouxbe Cooking School. Visit http://www.pbnhc.com for details. It's a movement! As a 501c3 approved not-for-profit organization, The Plantrician Project produces the International Plant-based Nutrition Healthcare Conference. This CME accredited event is just one medical education program of a multi-faceted initiative dedicated to educating, equipping and empowering medical practitioners and their patients and clients with the educational tools and resources needed to inspire their shift from the Western industrialized diet to a life-changing, plant-based way of living. This is essential to our ability as a society to usher in both sustainable human health and a sustainable healthcare system. The Plantrician Project transcends the food=health vs. food=disease equation in that it also connects the dots between our food choices and their impact on many of the global sustainability issues we face—including our ability to feed the world's burgeoning population. Visit http://PlantricianProject.org and http://FoodMath101.org for details.